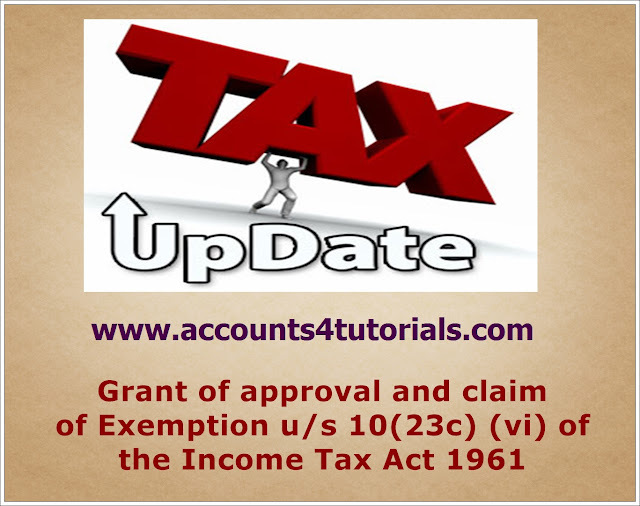 Home Income Tax Clarification on certain issues related to grant of approval and claim of exemption u/s 10(23C)(vi) of the Income-tax Act, 1961. Clarification on certain issues related to grant of approval and claim of exemption u/s 10(23C)(vi) of the Income-tax Act, 1961. Sub-clause (vi) of clause (23C) of Sec 10 of the Income-tax Act, 1961 ('Act') prescribes that income of any university or other educational institutions, existing solely for educational purposes and not for purposes of profit, shall be exempt from tax if such entities are approved by the prescribed authorities. Such approval is not required in cases of university or educational institutions wholly or substantially fincanced by the Government [sub-clause (iiiab)] or if their aggregate annual receipts do not exceed Rs.1 crore [sub-clause(vi). the prescribed authority has to ensure that the applicant institution must exist "solely for educational purposes and not for purposes of profit". There are several Provisos to clause (23C) of section 10 and prescribe, interalia, various monitoring conditions subject to fulfillment of which only, the exemption can be availed. These monitoring conditions include mode and manner of application of funds, maintenance and audit of books of accounts in certain situations etc. Some other Provisos prescribe the manner of making application u/s 10(23C) (vi) and the circumstances when an approval granted earlier can be withdrawn. 1.1 Clarification has been sought on scope of enquiry that can be made by the prescribed authority while granting approval u.s 10(23C)(vi), i.e., whether it would be sufficient for the prescribed authority to consider the nature, existence for non-profit purposes and genuineness of the applicant institution or the conditions prescribed under various Provisos are also required to be considered at the stage of grantign approval. 1.2 In this connection, attention is drawn to the decision of Hon'ble Supreme Court in case of American Hotel and Lodging Association Educational Institure vs. CBDT [301 ITR 86] (2008)in which it has been held that at the time of granting approval u/s 10(23C)(vi), the prescribed authority is to be satisfied that the institution existed during the relevant year solely for educational purposes and not for profit. Once the prescribed authority is satisfied about fulfillment of this criteria i.e.the threshold pre-condition of actual existence of an educational institution under section 10(23C)(vi), it would not be justifiablc, in denying approval on other grounds, especially where the compliance depends on events that have not taken place on the date on which the application for grant of approval has been made. 1.3 However, the prescribed authority is eligible to grant approval u/s 10(23C)(vi), subject to such terms and conditions as deemed necessary including those falling within the framework of various Provisos to the said clause of section 10. It has also been clarified in the said judgment that the compliance of prescribed cinditions can be gauged while monitoring the case and in case of any breach thereof, the approval can be withdrawn. It is, therefore, clarified that the principle laid down by the Apex Court in Amcrica Hotels case (supra) must be followed while considering the applications filed seeking approval for exemption u/s 10(23C)(vi). 5. Impact of extraordinary powers of the Maraging Trustees to appoint remove or nominate other trustees. 6. Filed authorities are advised to keep the above position in mind while dealing with the matters of approval/exemption u/s 10(23C)(vi). Similar principles would also apply to cases covered u/s 10(23C)(via) of the Act.